Though he suffered as a prisoner of war in Vietnam, he seems blind to the suffering inflicted on that nation by America's brutal and misguided war. 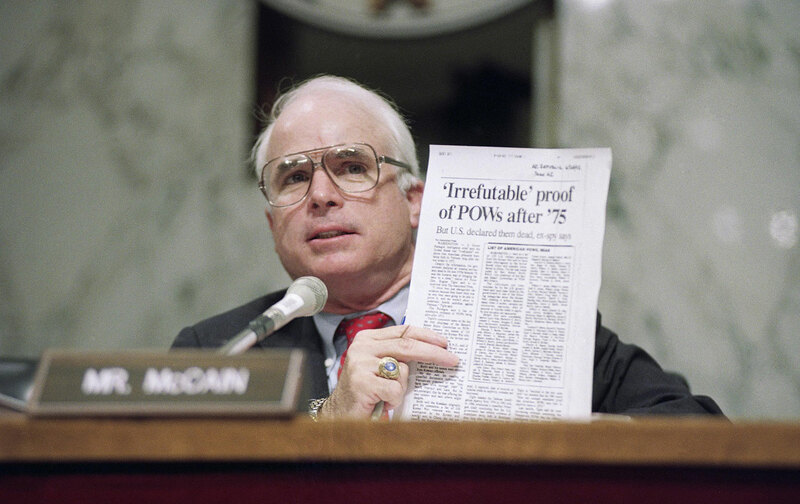 In this June 24, 1992 file photo, John McCain holds up an article during a hearing of the Senate Select Committee on POW/MIA Affairs. Humming along under a gray New Hampshire sky aboard the Straight Talk Express, his campaign bus, hero-for-President Senator John McCain says, “The shadow of Vietnam doesn’t hang over everything I do. But he’s wrong–it does. Indeed, it defines the man. For decades, McCain has brandished his years as a wounded, roped and beaten American prisoner of war in North Vietnam to build his reputation. He’s used it to boost his political career, first as a member of the House of Representatives, then as a senator, now as a presidential candidate who has emerged from the Republican pack as Texas Governor George W. Bush’s chief competitor. The story of McCain the POW mesmerizes many voters and has charmed the media, who’ve been attracted by McCain’s accessibility and blunt-spoken manner. In a political season when “character” rather than issues seems to be the determining factor for many voters, McCain is counting on his Vietnam experience to trump Bush and, if it comes to that, Vice President Al Gore or former Senator Bill Bradley. Indeed, for some Americans, his endurance under wartime prison conditions–described in excruciating detail in his bestselling autobiography, Faith of My Fathers–is all that needs to be said about McCain. Measured against the lightweight, almost juvenile Texas Governor, he appears mature and reliable. “McCain’s a man!” says Caroline Wojcicki, 50, of Amherst, New Hampshire, who’s come out to cheer on the Arizonan at a candidates’ debate in Manchester. “George Bush is still a boy–maybe a good boy, but still a boy.” In that, she echoes the sentiments of many New Hampshire Republicans and independents, who’ve elevated McCain to clear front-runner in polls taken in the Granite State. But there is a dark side to McCain’s posture as a hero. Though he suffered as a prisoner of war in Vietnam, he seems blind to the suffering inflicted on that nation by America’s brutal and misguided war. Trained as a naval officer, grandson of a senior World War II admiral and son of another admiral who, McCain says, “had command over the war in Vietnam” as commander in chief, Pacific command, McCain is too willing to call on American military power to enforce US interests overseas. Angry in temperament and pugnacious in style, McCain exhibits a swaggering readiness to avenge America’s defeat in Vietnam. Like the man he succeeded as senator from Arizona, Barry Goldwater–whose militaristic style alarmed voters when he ran for President in 1964–there is only one word to describe the prospect of John McCain with his finger on the button: scary. For McCain, strategic thinking starts and ends with Vietnam, and with the Americans who fought and died there. “The memory of them, of what they bore for honor and country, causes me to look in every prospective conflict for the shadow of Vietnam,” McCain said in a speech to the Veterans of Foreign Wars in August. Yet in looking for that shadow, McCain draws all the wrong conclusions. Rather than accepting America’s defeat in Vietnam as a humbling one and a fitting end to an arrogant and vainglorious exercise of military power, McCain considers the war in Vietnam to have been a “noble cause,” whose loss might have been avoided but for the timidity of America’s political leaders. Like many Vietnam-era military men, McCain believes that the war could have been won had America sent ground forces into North Vietnam and launched a strategic bombing campaign using B-52s. “That,” says Daniel Ellsberg, the Vietnam-era Defense Department official who leaked the so-called Pentagon Papers, “is an incredibly discredited point of view.” McCain appears unworried by concern that such actions would have led to enormous US casualties and perhaps caused either China or the Soviet Union to enter the war. McCain’s gung-ho attitude toward the Vietnam conflict has its roots in the months he spent in Vietnam’s skies. In Faith of My Fathers he describes how, looking down at Soviet ships unloading arms in Vietnamese ports and at the construction of surface-to-air-missile sites, he chafed at the “frustratingly limited bombing targets” that restricted air raids to military installations, roads, bridges and power plants, calling such constraints “senseless” and “illogical.” “We thought our civilian commanders were complete idiots,” he wrote. Appearing before a packed audience at a town-hall meeting at Phillips Exeter Academy in New Hampshire in early December, McCain resoundingly called on his listeners to recall “the lessons of Vietnam,” which–rolled up into an applause-gathering soundbite–means, he said, “never again do we send our men and women to fight and die in foreign conflicts unless our goal is victory!” Practically speaking, McCain considers the lessons of Vietnam to be as follows: America’s armed forces should be utilized when “US vital interests are threatened,” which interests McCain liberally defines as including “ensuring the survival and prosperity of the American people, defending our allies and combating such global threats as terrorism, the proliferation of weapons of mass destruction or narcotics.” Though McCain consistently opposes the use of US forces in nonstrategic or humanitarian missions like Somalia and Haiti, when US interests are at stake, he believes, Washington must make a full-scale commitment to win, even if it means total war–an approach that he applies to crises around the world. At the height of the crisis in Kosovo, McCain clamored for an invasion, bitterly criticizing the Clinton Administration for its “excessively restricted air campaign” and its decision to “refrain from using ground troops,” adding: “These two mistakes were made in what almost seemed willful ignorance of every lesson we learned in Vietnam.” Similarly, during the flare-up in 1994 over North Korea’s nuclear program, McCain recklessly accused President Clinton of “appeasement” of Pyongyang, warning, “The time for more forceful, coercive action is long overdue.” McCain demanded that the United States increase its alert status; mobilize US troops; deploy aircraft carriers, more fighters and Apache helicopters; pre-position bombers and tankers; and announce the immediate application of economic sanctions–even while recognizing the strong possibility that such actions could lead to war on the Korean peninsula. And on Iraq, he says that “the only way to prevail is to strike disproportionate to the provocation,” criticizing the White House for “the extremely limited scale” of bombing raids there. If today McCain is obtuse about Vietnam, a telling incident from the summer of 1967 indicates that for a fleeting moment, at least, he came face to face with his conscience over Vietnam–and blinked. Stanley Karnow, author of Vietnam: A History, thinks the media ignore Vietnam in part because the war is ancient history for a younger generation of reporters. “The animosities of the war, the days when people were screaming at each other over dinner tables, that’s all gone now,” he says. “Probably not many people under the age of 50 even remember the war.” And, for reporters over 50 who opposed the war, perhaps McCain’s candidacy allows them to expunge a bit of lingering guilt over the way Vietnam veterans were excoriated. Reporters also praise McCain for his plain-spoken openness. Unlike Bush, for instance, who is jealously protected from unsanitary encounters with the press by his campaign, McCain is constantly surrounded by reporters and never speaks “off the record.” His penchant for off-color humor, rather than tarnishing him, appears to put reporters in awe of his candor. Even cruel jokes, such as the one that McCain told about Chelsea Clinton being ugly because Janet Reno is her father, slide off McCain’s back. And the media have another interest as well: Were his candidacy to unravel, the race for the GOP nomination would be all but over, making the campaign much less interesting to report on. Above all, McCain is a good story. In countless upbeat profiles, a great deal of attention is spent examining the areas in which McCain parts company with Republican orthodoxy, such as campaign finance reform and tobacco. Ask him about a variety of issues–healthcare, telecommunications, taxes–and McCain fires back with a comment on the “evil and pernicious influence” of wealthy campaign donors. “I’m determined to give government back to you by ridding the government of the big money from special interests,” McCain tells a packed town meeting in New Hampshire, and his passion seems genuine. Yet McCain stands far to the right on many issues. He supports the Star Wars missile defense boondoggle and never tires of accusing President Clinton of underfunding the Pentagon, while surrounding himself with hawkish foreign policy gurus, including Henry Kissinger, Jeane Kirkpatrick, Brent Scowcroft and Lawrence Eagleburger. He supports school vouchers, privatization of Social Security and a constitutional amendment mandating a balanced federal budget. He backs the flat tax, the death penalty and a lock-’em-up approach to crime. He opposes gun control, abortion and increasing the minimum wage. He opposes government regulation as a matter of principle. He voted to impeach President Clinton, and he supported every item in Newt Gingrich’s 1994 Contract With America. He’s voted for an amendment to outlaw flag-burning. He backs tort reform and free trade, including NAFTA and normalizing trade relations with China. He voted against protecting homosexuals from job discrimination, and (though he’s changed his mind since) he voted against making Martin Luther King Jr.’s birthday a holiday. In the end, it’s hard to see how McCain can win the GOP nomination. Without a doubt, he has a good chance of winning New Hampshire’s first-in-the-nation primary on February 1. According to Rick Davis, McCain’s campaign manager, his strategy there is to combine old-fashioned retail politics–he’s organized more than sixty town meetings and plans many more–with an effort to target the state’s 100,000-plus veterans and the 300,000-plus independent voters, who can choose to vote in either the Republican or Democratic primary. In 1996, says Davis, turnout in the Republican primary was 180,000. Still, should McCain win New Hampshire, he’ll then face Bush in an escalating race in big, expensive states where Bush’s gigantic fundraising advantage and high name recognition, not to mention the support of most of the Republican Party establishment, will severely test McCain’s ability to compete. But in the end, is it enough to be plain-spoken if one is also so wrong? “The fact that he says what he thinks is in his favor,” says Ellsberg. “But what he thinks is cockeyed.